UPDATE: the Emmi-Dent 6 toothbrush has been replaced with updated model – Emmi-Dent Chrome Ultrasonic Toothbrush. If you are not just looking for any kind of toothbrush, one of the best options that can be taken into consideration would be the Emmi-Dent 6 Ultrasonic Toothbrush. 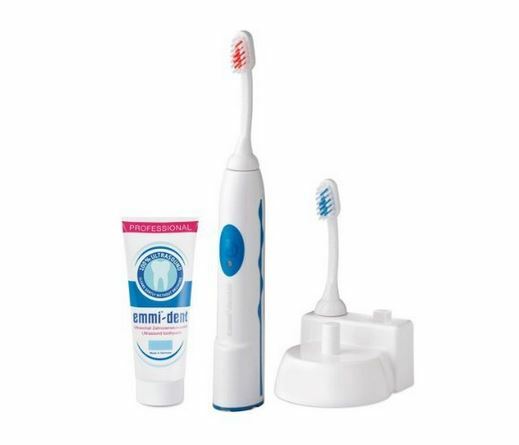 The revolutionary technology used in EmmiDent 6 toothbrush in dental hygiene that is guaranteed to make your teeth healthier, the same way that it was able to deliver guaranteed results to the people who have already used such. Ultrasonic toothbrushes have been popular because of their use of ultrasonic waves in being able to deliver an effective cleaning capability. With this, you can be assured that your toothbrush has the better ability to remove tartar and whiten your teeth, or generally maintain a healthier oral hygiene. In the rest of this article, you will be provided with more information on the different features that you should look for an ultrasonic toothbrush, as well as some of its features and customer reviews to help you decide as to whether or not you will purchase and use this product. These things are expected to have you convinced on the superior reliability of this product. Brand Name – It is often true that the brand name speaks a lot about a product, If you want a trusted ultrasonic toothbrush, it is important that you choose from the reputable brands in the market, to be assured that the anticipated results will be achieved. Timer: This is one of the essential features that you should be looking for an electronic toothbrush. This will make sure that you allot enough time for cleaning your teeth, as well as its different parts, such as the front and the back. Nano-bubbles: Aside from the ultrasound technology, another important thing that should be present in an ultrasonic toothbrush is the nano-bubbles. This makes the brush more effective and efficient in terms of maintain a healthier oral hygiene. Ultrasonic Chip: Although many toothbrushes are called ultrasonic toothbrush, not all of them are equipped with an ultrasonic chip. It is important to choose a toothbrush that is equipped with one to be more assured of its high level of functionality. Ability to Promote Overall Oral Health: It is not enough that your tooth brush is able to remove the stains on your teeth and keep it white. Make sure to choose a brush that can keep the whole mouth clean, including the gums and cheeks. One of the best things about this product can be seen from the brand name itself. Emmi-dent is one of the brands in the market that delivers an exceptional performance in terms of ultrasonic cleaning, and it has been one of the pioneers of such an innovative approach in oral hygiene. In addition, the patented ultrasonic microchip that is built in this toothbrush is also worth mentioning. This chip can deliver as much as 96 million ultrasonic impulses within one minute, which makes sure that cleaning is more efficient as it reaches more areas, even deep down. The ultrasound and nano-bubbles created by this toothbrush also makes sure of its efficient and effective functioning. Some of the most important functions of these features include the removal of stains without the need to use bleach or any other chemicals which may be bad for your oral health. The nano-bubbles in this tooth brush are especially formulated, which makes them more helpful in cleaning your teeth. They are smaller by up to 1000 times, which makes it possible to reach in between teeth and the smallest crevices that could not be cleaned by any other toothbrush that is available in the market. When all of the essential features of this toothbrush are combined, users can anticipate nothing but superior oral health, especially with its ability to remove plaque, tartar, and other impurities, and to whiten your teeth and improve the overall health of your mouth. It is common for many people who have already used this toothbrush to commend the technology that is embedded in this product. For instance, while other sonic toothbrushes can only deliver 30,000 mechanical rotations within one minute, this specific model can do 96 million oscillations within the same duration. Many customers have noted how this product is able to deliver the highest level of effectiveness, unlike in the case of others that rely on pure marketing strategies. Many of its users have remarked that the manufacturers stand true to the claims that they make. More so, it is also common for the users of this ultrasound toothbrush to be perfect even if you have implants, veneers, and crowns. None among its users have reported any hazardous side effects that were associated with the use of this model. In addition, many of the users of this toothbrush did not also forget to take note of the fact that it allows them to have a fresh breath for almost 12 hours, as well as the ability of the toothbrush to deliver the most superior cleaning performance among other innovative oral care products that can be seen in the market today. There were some customers, however, who were disappointed with the availability of just one size of the toothpaste that comes along with the ultrasonic brush. This means that many were unable to stock for long-term use, and it needs to be replaced after approximately 6 weeks of use. It is common for people who purchase this toothbrush to also buy the Emmi-dent 4-pack of brush heads. This is basically because the brush heads should be replaced after a pre-determined time to make sure that it will still deliver superior oral cleaning. Another item that has been commonly bought is the Emmi-dent’s special Nano-bubbles toothpaste.It is available in both fresh and mild. This is an essential item to be used with the toothbrush because it enhances its cleaning efficiency and effectiveness.